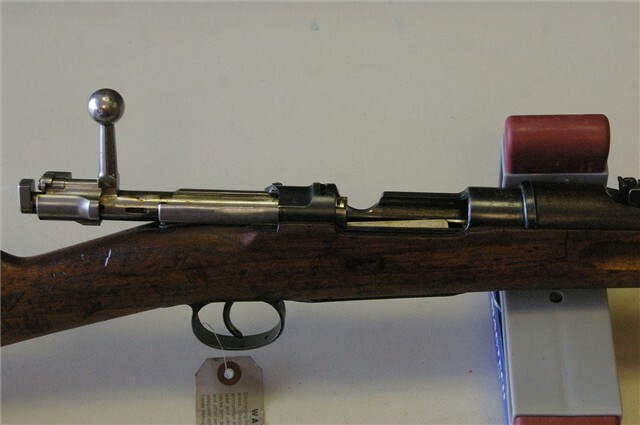 The last one is a Swedish Mauser bolt-action rifle (possibly built in Germany) - it looks like an original M94 to me. and No 2 is an over-engineered bottle opener for pulling corks. 5. 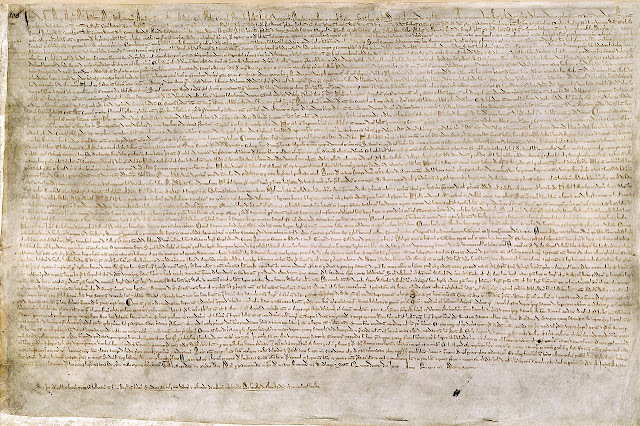 Yep, Magna Carta Libertatum ~ the original 1215 charter concerned the medieval relationship between the monarch and the barons, rather than the rights of ordinary people ~ and since 1216 its teeth have been gradually pulled until almost all of its remaining content was repealed from the statute books in the 19th and 20th centuries. 2. Well worth screwing onto a bar ~ if only I had one ~ that is a glorious object of transcendent beauty. (8) Pair of spectacles, early leather framed type. 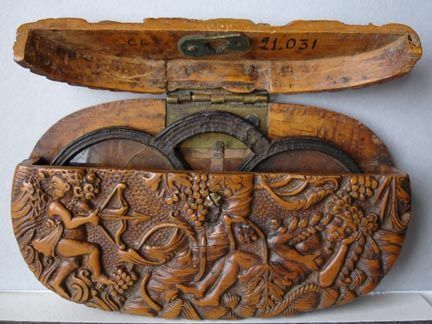 in Slightly later later carved treen spectacle case (17th/18th century. 1. It has the lustre of moonstone, Mike, but it is a specimen of Labradorite, one of my favourite minerals. 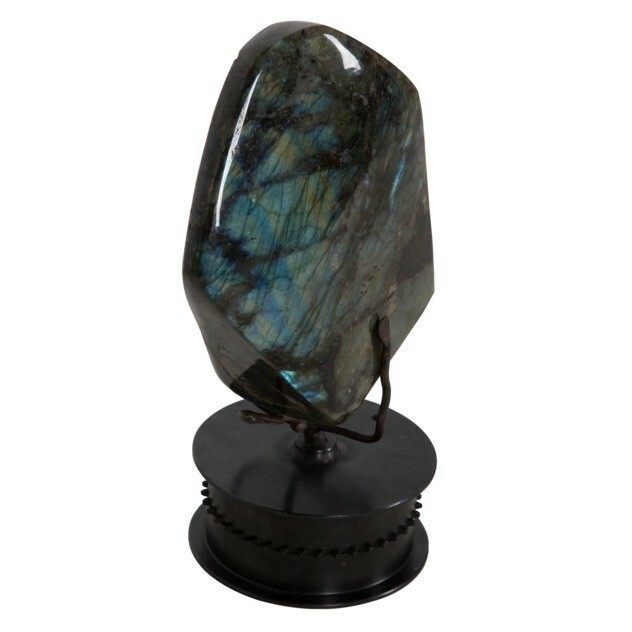 Lore of the Inuit peoples claim Labradorite fell from the frozen fire of the Aurora Borealis. A member of the Feldspar family it is treasured for its remarkable play of color, known as labradorescence. The stone, usually gray-green, dark gray, black or grayish-white, is composed in aggregate layers that refract light as iridescent flashes of peacock blue, gold, pale green, or coppery red. The predominant blue varies with the light, displaying hues from deepest blue to various shades of pale, almost blue-green. It was discovered in Labrador, Canada, by Moravian missionaries in 1770 who named it for the area. 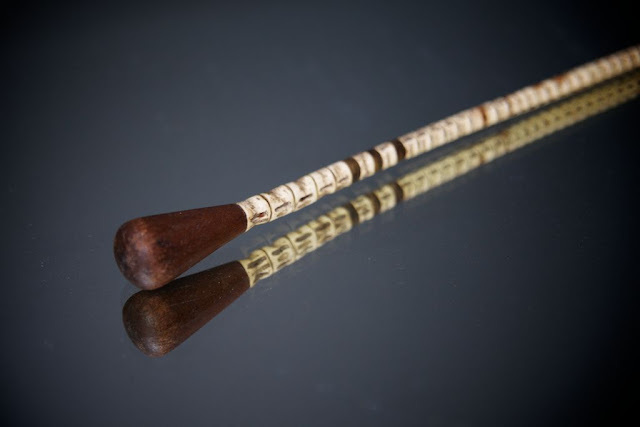 It is, however, referenced in legends by older Inuit tribes, and was known to be in use by the Boethuk peoples of Newfoundland and Labrador. 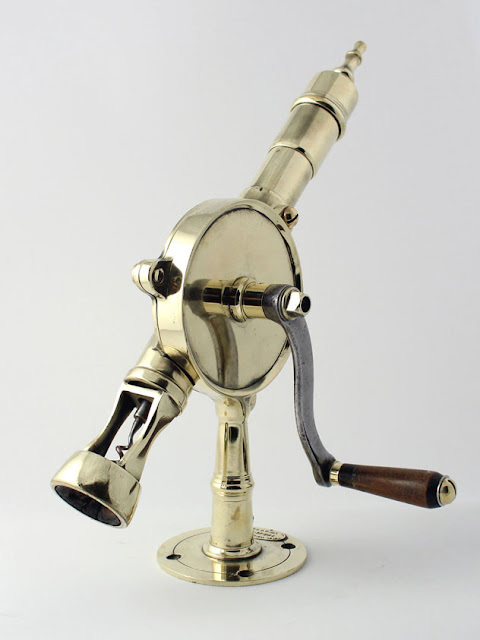 It became a popular gem in Europe in the eighteenth and nineteenth centuries. 7. You're on the right track, it's a riding crop of shark vertebrae. 8. Full marks Mike, puffick! 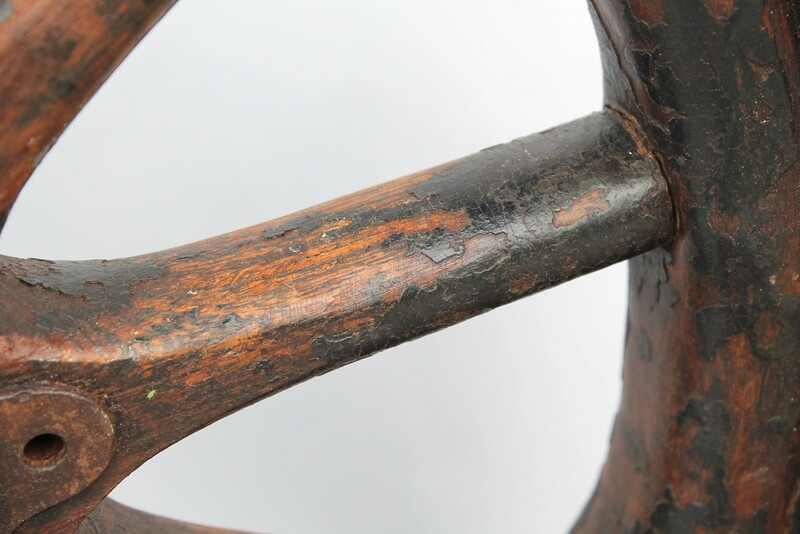 3. is a wooden wheel from and early motor car. 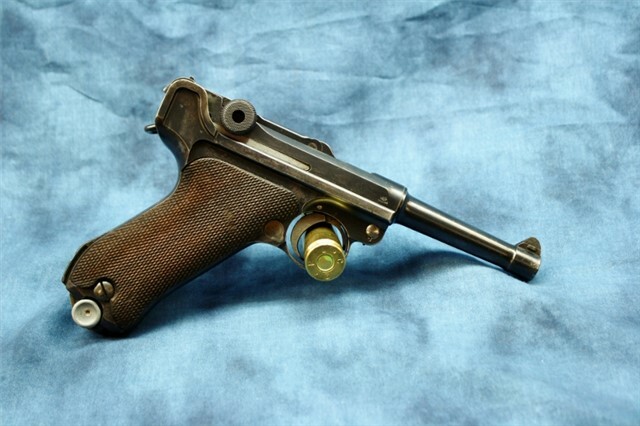 4. is a Luger (propped up by a round of ammo through the trigger-guard). 6. 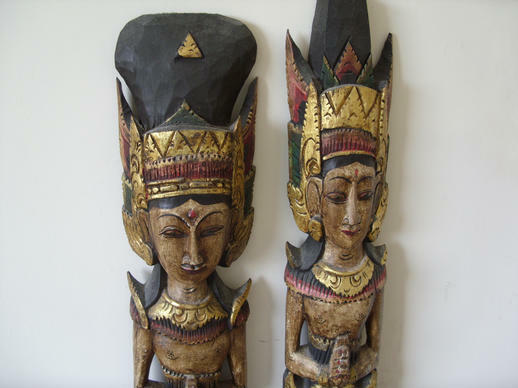 Carved and painted treen figures of The Hindu deities Rama and Sita.